Mortice cylinder sashlock without forend. Designed for installation with no front plank. The model corresponds to the forth (the highest) class of the Russian governmental standard. The model has a latch. The model locks a door with three steel locking bars 16 mm in diameter which move forward 36 mm. 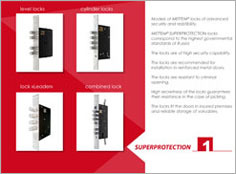 One of the locking bars contains a core made of hardened steel which prevents from sawing.